Solar powered and made to last! G-Shock Watches by Casio – the ultimate tough watch. Water and shock resistant, and built with uncompromising passion. 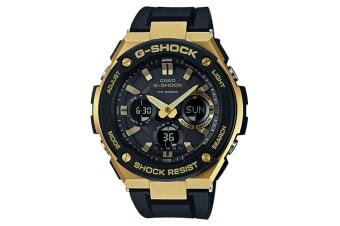 Since its birth in 1983, G-Shock by Casio has continued its unrestrained evolution whilst retaining its unique, basic structure. Today, G-Shock takes up challenges beyond the limits of time and common knowledge by designing watches to withstand the most harsh of conditions. Its rugged shape and robust styling originated with an engineer’s brief calling for an “unbreakable watch”, creating the ideal watch for outdoor adventures, tradesmen workers and those wanting a sturdy, stylish and timeless watch.